Is it fact or fiction? Special effects experts Adam Savage and Jamie Hyneman take urban legends and put them to the scientific test. 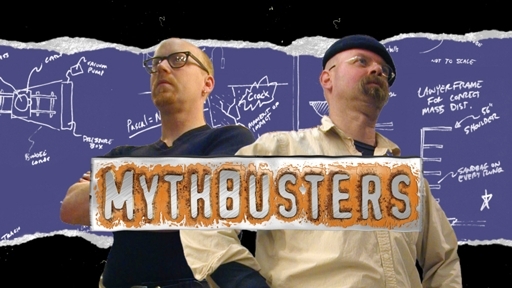 From surviving a plane crash to training a goldfish, the MythBusters team designs an experiment to prove whether it’s possible or another myth busted. The concepts presented in each program will have students looking at science in a whole new way. We have the following 20 episodes: Animal Behavior, Bacteria, Botanical Growth, Buoyancy, Chemical Changes, Chemical Reactions, Circular Motion, Combustion, Electricity and Magnetism, Electricity, Energy Conservation, Force and Motion, Forces, Gravity, Inertia, Myths About Motion, Reflected Energy, Sound Energy, Water Displacement, and Work and Energy. This entry was posted on May 21, 2008 at 9:37 am	and is filed under Intermediate, Junior, Senior. Tagged: Animals, Biology, Chemistry, Physics, Plants, Science Experiments. You can follow any responses to this entry through the RSS 2.0 feed. You can leave a response, or trackback from your own site.